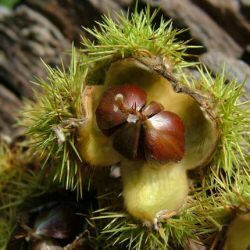 Buy Sweet Chestnut Tree (Castanea Sativa) online from UK tree supplier of cell grown broadleaf hedges and shrubs. Sweet Chestnut (Castanea sativa) is a different species to the Horse Chestnut (Aesculus hippocastanum). The Sweet Chestnut has been a feature of the British landscape since Roman times and hails from southern Europe. Renowned for its production of delicious sweet chestnuts in hot summers, although, we think that chestnut production is unlikey from a line from Bristol across to Kings Lynn. Prove us wrong! Expect a final height of 35m (117ft). Typically, Horse Chestnut may be planted as an individual tree or as an avenue of trees. Estate and Policy Woodland plantings from the 18th and 19th Century often found this tree planted along with other exotic non-native species. Today, 150 years later these trees form an amazing sight and we think that this tree worthy of planting to achieve the same effect for future generations.